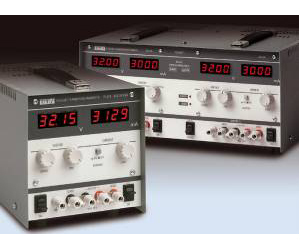 The Thurlby Thandar PL series of laboratory bench power supplies has established itself in many countries as an “industry standard” range. PL series units incorporate digital meters with a 3.75 digit scale length (4095 counts) to provide greater accuracy and resolution than other PSUs. Large and bright LEDs give a clear and unambiguous reading. An update rate of 4 per second provides near instantaneous response. Separate meters are used for voltage and current, eliminating the need for meter function switches with their attendant problems of misinterpretation. A damping switch for the current meter simplifies measurements on rapidly varying loads. The PL series sets the standard for simple and comprehensive control. Voltages are set with coarse and fine controls for speed with precision. Currents are set with a semi-logarithmic control for increased resolution at low current levels. The DC output switch enables voltage and current levels to be set before the load is connected. With the output switch “off” the the current limit set point is displayed. With the output switch “on” the actual output current flowing is displayed.